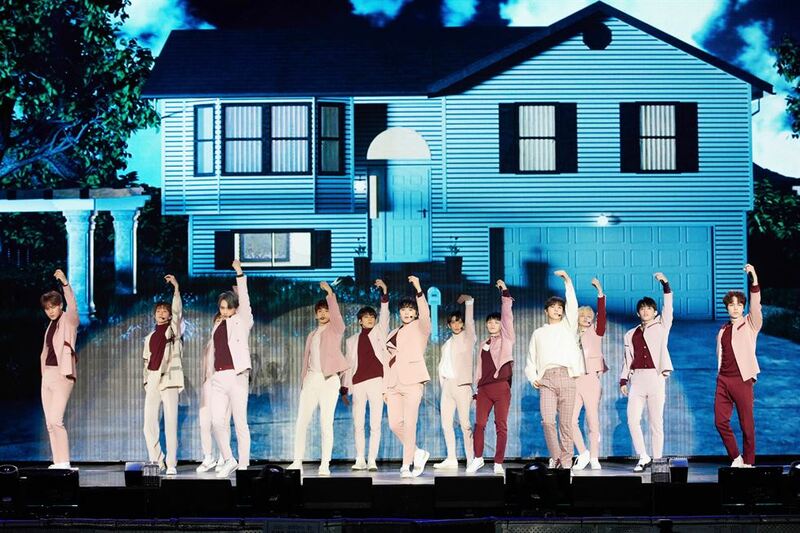 The 13-piece act Seventeen's new single "Home," an urban future R&B song telling of the warmth of home, is off to an incredibly hot start on digital platforms. The group's main track has entered the Top 10 on major local music streaming charts and the U.S. iTunes' all-genre Top Albums chart just a few hours after its release. "Home" is one of the album's three tracks that brings together all 13 members with the hook's lyrics going "Cuz I'm your home home home home where you can cry and where you can always come to." Members Woozi and Seungkwan co-composed the song. "Before we make each album, all members discuss what message we want to deliver in the lyrics. For this album, we wanted to write about love, growth and, most importantly, consolation that everyone could relate to," Woozi said during the press showcase for promoting their sixth mini-album "You Made My Dawn" in Seoul, Monday. "We think the message holds great power and it influences the overall result of the song." Member Dino shared that themes of growth, warmth and consolation run through all six tracks, saying the group put its faith in the success of the latest record. "I hope the public and our fans regard this song as a genuine artist's work rather a commonplace idol song," he said. Other tracks include "Good to Me," a contemporary R&B pop song with 808 bass rhythms co-written by Woozi and Bumzu, "Hug," a ballad track recorded by Seventeen's vocal team, "Chilli," a trendy, upbeat track recorded by a hip-hop team and "Shhh," a Moombahton trap piece recorded by the performance team, and "Getting Closer," which comes with breathtaking choreography. As Seventeen's three teams focus on vocals, hip-hop and performance, respectively, the members said they are open to the idea of releasing separate albums as sub-units. "There are no set plans yet, but we are open to all sorts of opportunities for making albums as sub-units," Mingyu said. Woozi added, "If there is an opportunity, we would like to promote ourselves as sub-units. But I think Seventeen is at its best when we are together as one." Seventeen matched their single with killer choreography, in which 13 members execute triple airborne turns. When asked if it took them a while to learn the dynamic moves, Hoshi said, "The triple turn was, indeed, challenging, but we were able to learn it pretty fast because we have developed our teamwork after spending so much time together." Members also hinted at their plan to embark on a world tour this year. "We are still discussing our world tour plans with our label, but we would love to meet our global fans who have been looking forward to our new album. We have never thrown a concert in Europe, so we hope to visit there too," Dino said. Seventeen is scheduled to hold a concert in Japan in April, where the group has already built a solid fan base. "This year, we will work hard with an aim to take home the grand prize at annual year-end music awards ceremonies," Seungkwan said. Since making its debut in May 2015, Seventeen has had several hits including "Don't Wanna Cry," "Clap" and "Very Nice."